Several countries are now actively introducing forms of internet censorship by blocking access to social networks like Facebook and Twitter. Another common form of internet restriction these days is when you watch movies or television online, these are often geo restricted and can only be viewed from the country hosting the content. Several countries also block access to adult, political and popular file sharing sites like Kickass and ThePirateBay to stop you getting access to pirated content. The popular way to circumvent these restrictions is to use a VPN or proxy service that fools the website you are trying to access into thinking you are from a different country than you actually are. One of the most used VPN services for several years has been Hotspot Shield by AnchorFree because it offers a free version to its paid Elite subscription that gives you many advantages of a VPN but at no cost. 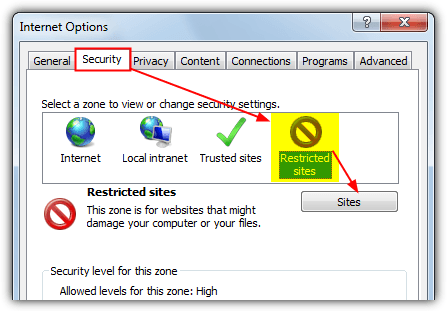 There are however, restrictions to using Hotspot Shield Free. Firstly it only allows you to access its US based VPN so you can only have a US IP address. Australia, Canada, Germany, Japan and UK VPNs are not available. It is also ad supported so every HTTP page you visit will have an inserted banner at the top of the page. Major streaming sites like Hulu or Netflix are forbidden and you must upgrade to use them. All access to subsequent web pages will be blocked until you either upgrade to an Elite subscription or wait for the block to be reset. Old methods to unblock this limit used to include resetting the network adapter MAC Address, but this no longer works. Ironically it’s actually far easier to bypass the bandwidth limit block now that it used to be and we were quite surprised it was so easy. 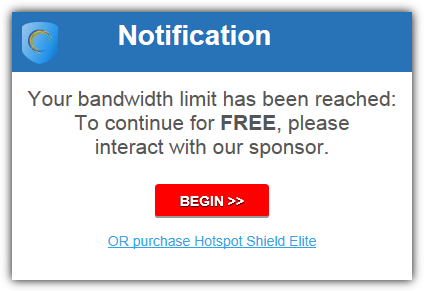 Probably the most annoying thing about using the free version of Hotspot Shield is the injection of Anchorfree’s ad banner into the top of your browser window. This not only looks unsightly but depending on your connection speed and hardware can also slow down the loading and displaying of pages. An old trick to block the ads using the Windows HOSTS file doesn’t work these days. The great thing about getting rid of the Hotspot Shield ads and bypassing the bandwidth limit is you can kill two birds with one stone because both are removed together by the same method. And that method is to simply run an ad blocker extension. If you are running Chrome or Firefox there’s a wealth of ad or script blocking extensions, most of them will work for this purpose. 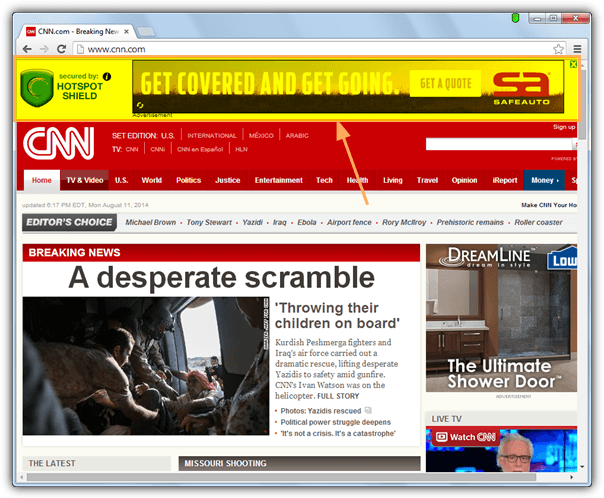 AdGuard, AdBlock or AdBlock Plus work just fine in Google Chrome. For Firefox, AdBlock Plus and NoScript work perfectly to disable the ads and the bandwidth limit, although in NoScript make sure you don’t allow anchorfree.net. 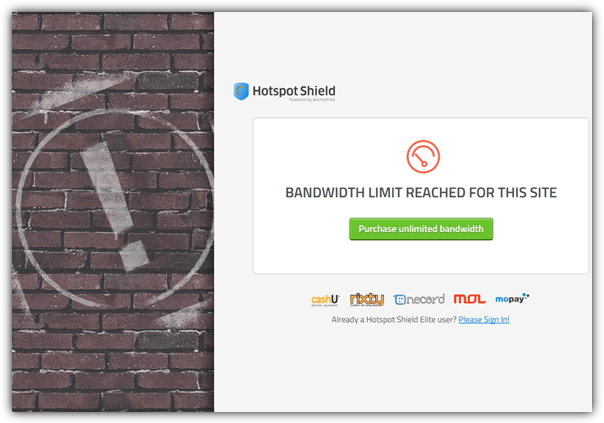 With this simple addition both of the most annoying Hotspot Shield restrictions will be gone! 1. Open Internet Explorer, click the Options icon (cog wheel) and select Internet Options. 2. Click the Security tab, click on Restricted sites and then press the Sites button. 3. In the “Add this website to the zone:” box enter anchorfree.net, click Add and the URL will appear in the Websites box. Close the windows to get back to the IE main window. You should now find no Hotspot Shield banners appearing in any Internet Explorer browser tabs from now on, a reload will be required on open tabs. 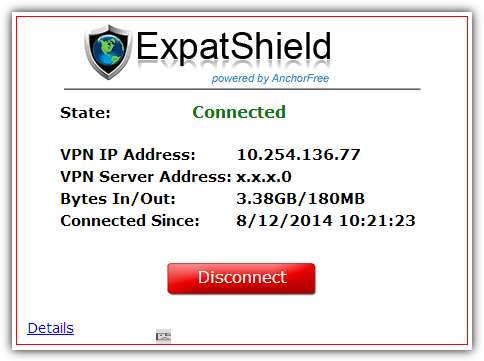 Anchorfree has another free VPN service called Expat Shield. This is similar to Hotspot Shield but is based on an old version of Hotspot Shield and is supposed to use a UK based VPN instead of a US based one. As the website lists Expat Shield as “unlimited bandwidth” it could be a better option for users simply wanting to bypass restrictions imposed in their country. Upon testing Expat Shield we found it’s not currently using a UK VPN and instead connecting to the US. This is why many Expat users can’t reach things like the BBC iPlayer because the IP is now coming from the US and not the UK. Whether it’s permanent or a temporary measure is unknown. Expat Shield also isn’t restricting access to streaming sites like hulu and Netflix, even though it comes from the same location as Hotspot Shield. We were unable to test whether streaming is available, but as you can access the sites, it remains possible. We encountered no bandwidth blocks in Expat although the tray icon does change from green-red-green sometimes signifying the connection has temporarily dropped, but the web interface didn’t say it was disconnected. 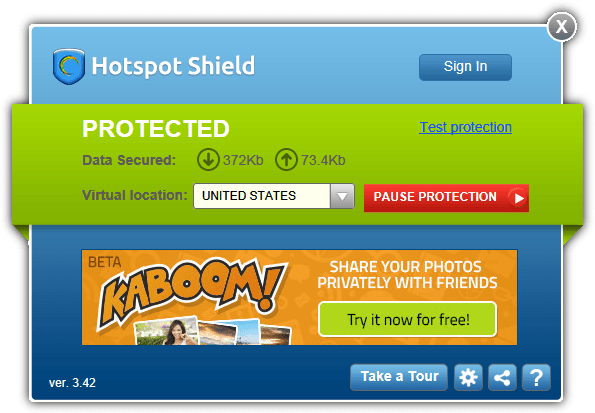 An ad banner is displayed but you can use the same methods to remove it from the browser window as Hotspot Shield. The HOSTS file method also works as this is an older version of Hotspot Shield, open HOSTS located in “C:\Windows\System32\drivers\etc” with Notepad and add the following line. It may take a few minutes to filter through and you might also need to clear your browser cache, but the ads should be removed from all your browsers after the change is recognized. Wish I could say it worked, but it do not, in my Windows 7 setting. I applied the anchormen change. This is awesome! You are genius. Thank you and i love you,thanks also to the creator of of adblock …..i love you guys. wow thanks…. it worked for me, it did connect..
thanks a lot…..it worked for me…. hi – thanks for this hint – experienced the same problem and solved it with help of your post! Thanks, you just made my day :-) Completely free and functional fast speed vpn connections! I just hope they don’t find out.